Bergen is a town of 220.000 inhabitants on the west coast of Norway. The flag of Bergen has a red bordered (on the upper and lower sides and at the fly end) white field with the town's seal/arms in the centre. In its present form the flag was established by a Royal Order in Council of 15th of August, 1924. The proportions are 9 to 12. The red border equals 1 part. The arms/seal is placed two parts from the outer Edges, and is 5 parts high and 4.5 parts wide. The seal of Bergen is first mentioned in a text from 1293, but the oldest surviving one is on a document from 1298 (kept in a collection in Copenhagen). It shows a castle on a cliff. Presently, the castle is grey, the cliffs are yellow or brownish, all on a red background. The design (and colours) has varied over the years. Today the castle has three towers and is placed on seven cliffs, representing the seven summits or mountains encircling the town. Around the seal is the text SIGILLVM COMMVNITATIS DE CIVITATE BERGENSI. On the flag this is replaced by a plain yellow border. The origin of the design with the white field and the red borders is probably a Norwegian flag signaling system from the 1800s, and the flag of Bergen only dates from the first part of the 19th century. From the early 1800s until 1924 the design of the flag varied, with the present design created in reaction against a flag with a blue field and the castle and cliffs without a shield (or circle). This unappealing flag was strongly criticised, and the flag was redesigned and approved in 1924. The flag of Bergen is already presented here, but there is better image of flag. No photo. According to FOTW page, as well as it seems to be hinted by [c2j87], the flag is not depicting the Bergen seal, buth rather the coat of arms - the difference being that the former includes the inscription, while the latter has only a golden circular border (not as thick as it is when it includes the inscription). 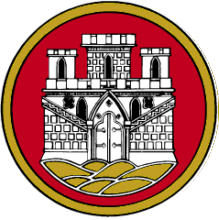 Anyway, the flag (and the seal and the coat of arms) was formally adopted by royal resolution of 15 August 1924. 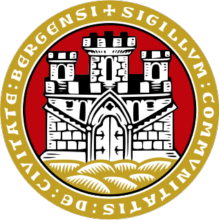 On https://www.bergen.kommune.no/bk/multimedia/archive/00259/V_pen_flagg_segl_lo_259838a.pdf, the central seal is smaller. Here is flag, coat of arms and seal of Bergen.